I love bags. I didn’t used to like them, but now I do for some reason. One of my ex-interns loves bags and shoes as well. Her theory was that it is easier to buy bags and shoes. You don’t have to take clothes off to try them on and no matter how much weight you gain or lose, the bags/shoes are always there for you. They will always love you. Better than any boyfriends she says. To tell you the truth, I don’t even know why I like bags. I don’t carry purses/bags on my day to day life. I don’t even carry wallet sometimes. I just stuff all my cash in my pocket. So, today as I was in the supply closet getting a pen, I saw the bags of all bags. 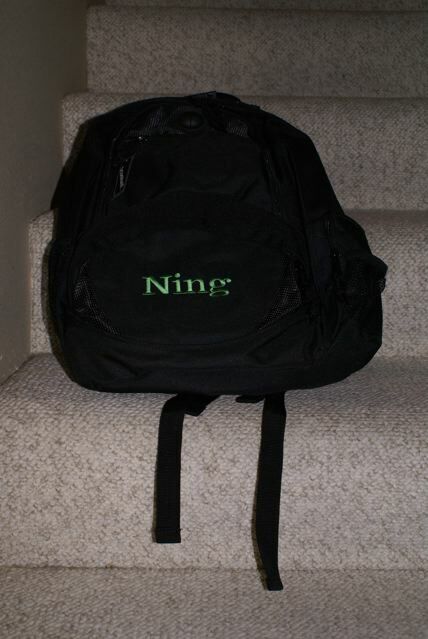 Not just any bags, but special Ning bags. I have seen them floating around in the office, and never knew where I could get one. Secretly I am jealous of people who owned these bags. It’s like they have their secret club! As I was eyeing them and making an plan to liberate one from the supply closet, Scott walks in. I think he went in there to get pens as well. I jokingly said to him I was thinking of breaking one of the bags out of the supply closet. He said no need, just ask Sara. I was not serious when I said that. I don’t like it when people take stuff without asking so I was not about to take stuff without asking for one. I wanted one but I didn’t want to ask for one (I am shy). I was prepared to walk away from my lovely, lovely bag and be sad and lonely without it. But, this story has a happy ending! Scott asked Sara, and Sara said ok. Now I have a brand new Ning bag! Scott is the hero of this story. Now I am in the club!